Minford falls to 6-2 following their loss to Wheelersburg Friday night at Ed Miller Stadium. Wheelersburg is outscoring their SOC opponents 98-0 in their first two conference games so far in 2018. The Wheelersburg Pirates were just too much to handle Friday night in their home SOC victory over Minford by a score of 49-0. The Pirates first score of the contest came on a Makya Matthews 51 yard punt return for a touchdown to take the lead 7-0 with 10:51 left in the first quarter after Minford went three and out on their opening possession. 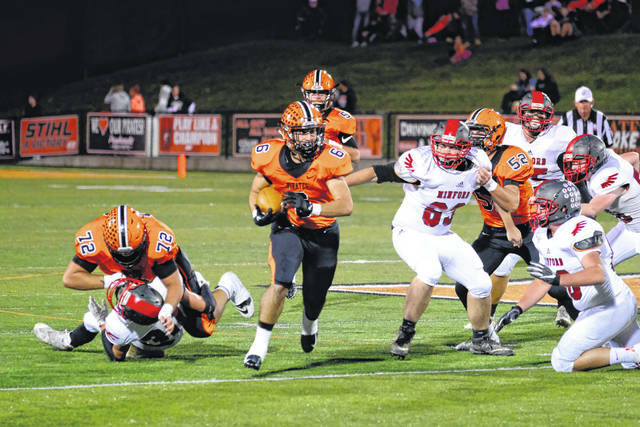 Matthews continued his incredible play on Wheelersburg’s first offensive possession. Senior quarterback Trent Salyers found Matthews for a 22 yard touchdown pass to extend their lead to 14-0 with 7:31 left in the first quarter. Wheelersburg would not waste any time getting the ball back and putting more points on the board. Salyers found senior wide receiver Tanner Holden on a 52 yard pitch and catch to extend their lead to 21-0 with 5:19 left in the quarter. Trent Salyers had a career day against the Minford defense. Salyers was able to find Hunter Ruby on a 45 yard touchdown pass to extend the Pirates lead to 28-0 nearing the end of the first quarter. Salyers would go on to throw two more touchdown passes in the first four minutes of the second quarter: a 13 yarder to Ashton Clevenger, and a 74 yarder to Dustin Darnell. Wheelersburg would tout a 42-0 lead heading into the half. Salyers finished Friday night’s contest 9/10 for 255 yards and five passing touchdowns. It wouldn’t be until 3:24 left in the contest where Wheelersburg would score their final touchdown of the game as Aaron Mastes found Corey Maxie for a 39 yard touchdown pass. That score would be the final one of the game, giving the Pirates the 49-0 home victory over the Minford Falcons. Kickoff at Ed Miller Stadium between the Indians and the Pirates is set for 7:00 p.m. next Friday night. 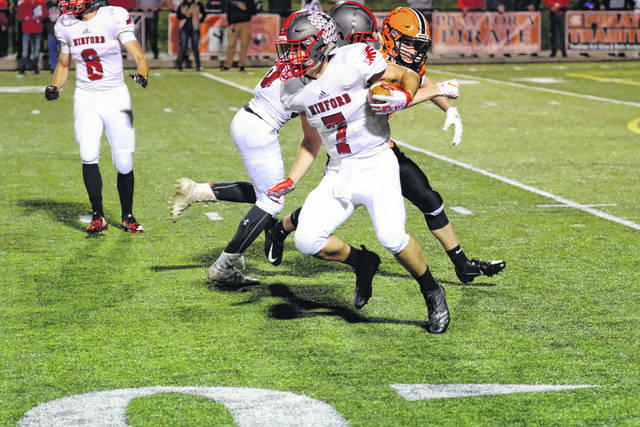 Minford will play host to conference foe Waverly next Friday night with kickoff also slated for 7:00 p.m.
https://www.portsmouth-dailytimes.com/wp-content/uploads/sites/28/2018/10/web1_risnerminford.jpegMinford falls to 6-2 following their loss to Wheelersburg Friday night at Ed Miller Stadium. https://www.portsmouth-dailytimes.com/wp-content/uploads/sites/28/2018/10/web1_horsleyburg.jpegWheelersburg is outscoring their SOC opponents 98-0 in their first two conference games so far in 2018.